Italian mezzo soprano Daniela Pini is singing in America for the first time tonight. 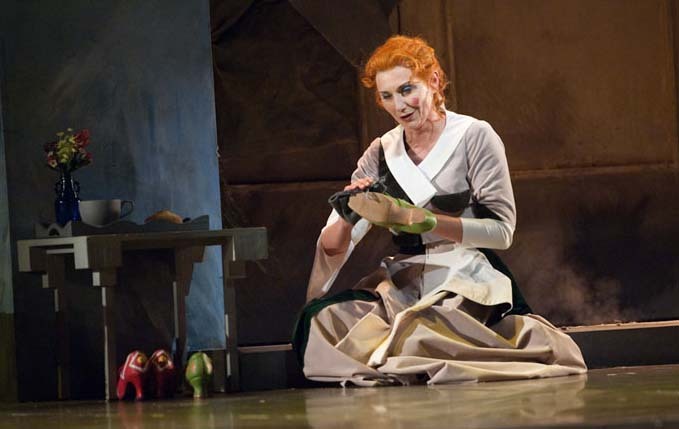 She makes her debut with one of her favorite roles: the title character of Rossini’s charming fairy tale, La Cenerentola. I chatted with her a week or two back (amid endless Seattle drizzle) about her background, her favorite places to sing in Italy, and a remarkable Cenerentola she produced—featuring 100 children from the village where she lives. Welcome, Daniela! We’re honored to be hosting your U.S. debut...now, is this also the first time you’ve been to this country? Yes, this is my first time in the States, I’m very excited! I feel I should apologize for Seattle’s weather. It’s not always this rainy and cold, in the US! No problem, it’s just like at home—it’s the same in Italy right now. I live close to Bologna. Yes, because I don’t know much about the United States or Seattle, I was reading about it. And I love walking around and getting to know a city that way. Although I haven’t had much time to explore, because we are always in rehearsal! I did get to a friend’s house on a day off, for cooking Italian food and American food, that was very nice. That’s pretty much what most of us Seattleites do this time of year; hang out indoors and cook. You know, Seattle is the most beautiful place in the U.S.—in July and August. Now, getting back to Italy, where were you born? In Lugo, the same place where Rossini’s parents were born, close to Pesaro. It’s in the middle of Italy, the north middle. It’s very nice, a very quiet place; I live in a small village. Always. I remember singing in bed every day when I was 4. But I started more officially when I was 6. Yes, and later I went to Bologna, for university, which is where I started to sing opera. 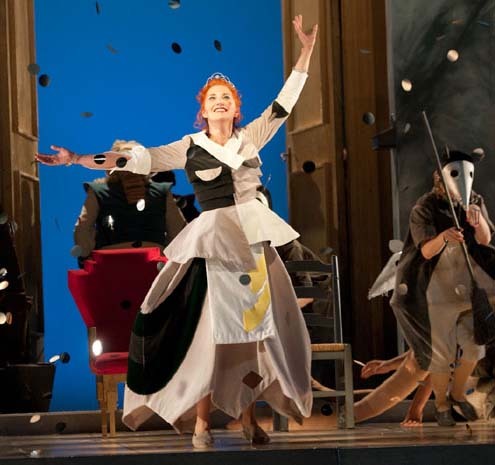 We heard about an unusual Cenerentola production you put together for your daughter’s school. Yes, my daughter is 9, and I went to her school several times, two years ago, to speak about opera, and I introduced the children to Cenerentola. Did you sing to them? Yes. And the children and teachers were very excited, so they asked me to do something more. So with friends and colleagues we tried to organize Cenerentola for a small Italian theater in Lugo di Romagna. We did the opera, with a little bit cut, with costumes, and ten instruments, and a hundred children singing along with us. Which parts did they sing? They had learned to sing it ahead of time, in their classes? Yes, I prepared a CD and the teachers taught them the music. And the bouncy chorus in the first scene, “O figlie amabile di Don Magnifico,” and—with Alidoro—“Qui nel mio codice delle zitelle,” when he interrupts the quartet and makes it a quintet. And some parts of the final Rondò. It was, it was wonderful. We had “pelle d’oca...” [gestures] How do you say? Goose pimples. That’s terrific, I wish I could have been there. The children gave us a very big energy. And I think it’s very important to do that, because the children are the future public. 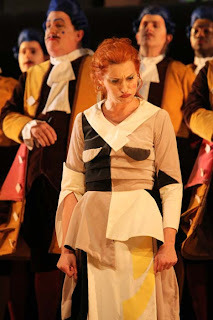 And doing this opera in Italy, the language isn’t much of a barrier...the libretto. All the world knows Cinderella, the story, it’s very easy for children. It’s not Trovatore, you know! I think it’s one of the only minor-key pieces in the entire opera. And I love the finale, of course...my big aria! Do you remember how old were you the first time you ever sang the Rondò? I was young, it was my first Cenerentola, in 2000. Because I remember being very scared, ahead of time. This opera is a comedy, but your character doesn’t get a lot of laughs. 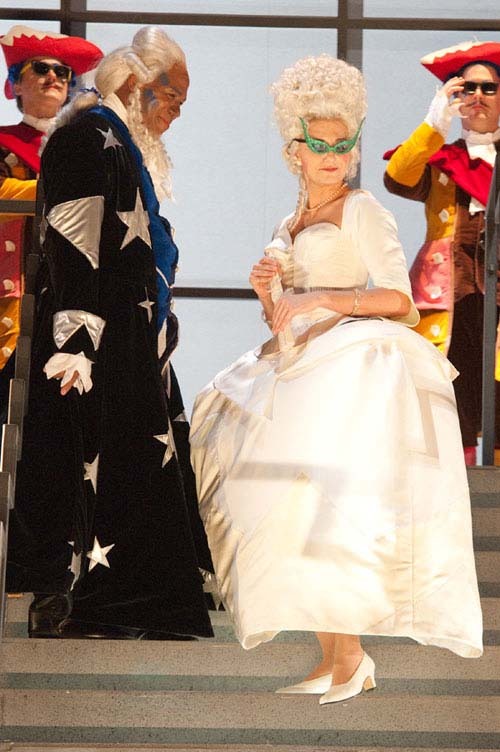 No, Cenerentola herself is not very funny. Do you play characters in other operas who are more comic? Spirited, plucky. Do you get to play a lot of boys? 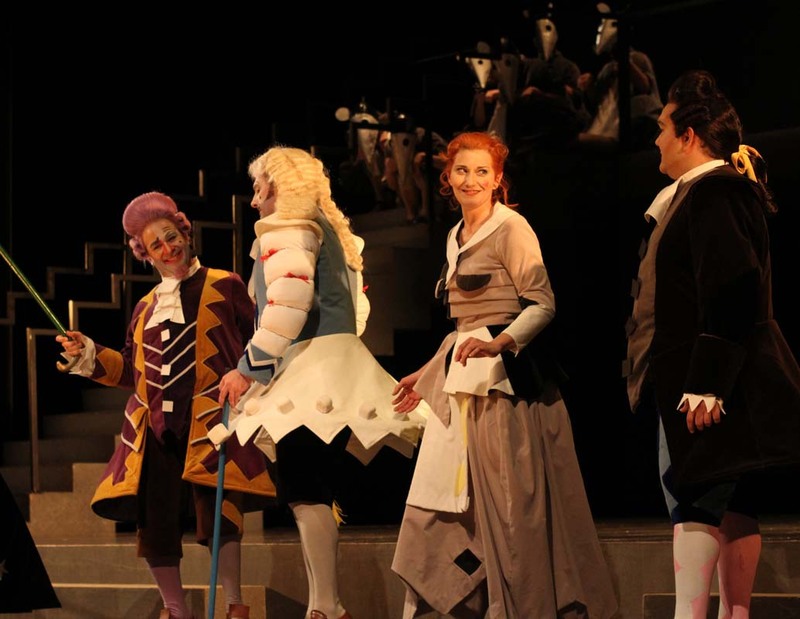 I guess Cherubino is a pretty silly character. He gets a lot of laughs. Oh, yes, he’s lots of fun. One last question: do you have a favorite place to sing in Italy? Do you like singing in the older, historic theaters? Or do you sing in many brand-new, high-tech, ultra modern places? Yes, we have many such; Teatro Carlo Felice in Genova is a new building, and Torino, too. At La Fenice, the opera house in Venice, the building is new, although the theater has been around a long time.